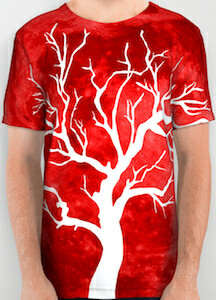 If you want a bright t-shirt with a tree then you just need this. The t-shirt has an all over design to make it look amazing from all sides. The background color of the shirt is a fire red and on top, your can see a silhouette of a white tree and the tree branches go all the way up to the top and on the sleeves. And this is a unisex t-shirt that comes in sizes XSmall – 2XL and it would look great on both men and women and I am sure the colorful shirt looks stunning on you.